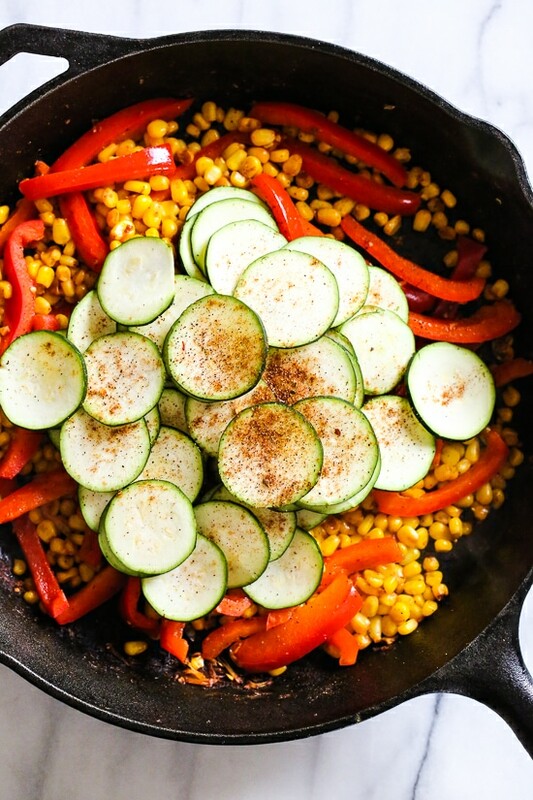 Southwest Chicken Skillet with Corn and Zucchini is the perfect veggie-loaded dinner made all in one pot! This veggie-loaded chicken dish is perfect for weeknight cooking! The chicken and vegetables are so flavorful, seasoned with Mexican spices and a squeeze of lime juice at the end which brightens it all up. And bonus, it’s made all in one pot for easy cleanup! I used boneless chicken thighs which for more flavor, but breasts would also work. This recipe is from Mary Younkin’s new book The Weekday Lunches and Breakfasts Cookbook (affil link) which is filled with so many easy home-cooked recipes that I know I’ll be making soon because they are recipes my family would actually eat! In fact, I had a hard time deciding which recipe to share because there are so many winners! Although this recipe could be cooked ahead and packed ahead for lunch for the week, it also makes a great dinner. I ate this as is, but you can also serve it over rice. Totally optional, but you can also add some queso fresco or Cotija cheese on top if you wish, although it honestly doesn’t need it! Store this in an airtight container for up to three days. Reheat on the stove, in the microwave, or covered in the oven. In a medium-size bowl, drizzle 1 teaspoon of the oil and season with 1 tablespoon of the Mexican Seasoning and salt. Heat a large skillet over high heat. Add remaining teaspoon oil to the skillet. Add the chicken and toss to coat. Cook 4 minutes, constantly stirring, until the chicken has browned and is cooked through. Transfer the cooked chicken to a plate and tent with foil to keep warm. Add bell pepper, corn, and garlic to the empty skillet. Sprinkle with the Mexican seasoning. Continue cooking over medium-high heat, stirring frequently, until the peppers soften slightly, about 5 to 8 minutes. Add the zucchini, season with remaining salt and cook, stirring often until the zucchini softens slightly, about 4 minutes. 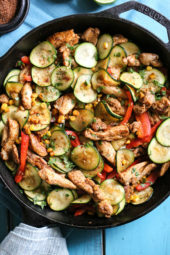 Return the chicken back to the skillet, add the lime juice and scrape all the browned bits off the bottom of the skillet, stirring and mixing the juices over the chicken and vegetables. Remove from the heat. Sprinkle cilantro and Cotija if desired. If using breast instead of thighs, Freestyle Points are 1 per serving. Calories 202.